2007/6 Seamus Carey got together some local residents to form Friends of Down Lane Park. We agreed the name Friends of Down Lane Park (FDLP) and its aims and objectives and a website www.fdlp.org.uk to publicise the group. 2005/5 Cara (Chestnut Estate Residents Association, Chair Sheik Thompson) had persuaded Haringey Council to setup a friends group for the Park. The friends group functioned well for some time but became inactive over a period of time. Spent the following months interviewing local people in the locality and in the parks. Drew up a report and presented it to Haringey Parks managers and lobbied with it. Lobbied since then for the renovation of the Park (see Plea to Council). has earmarked £500,000 of match funding which together with a similar amount from the lottery etc it is hoped ,will implement the masterplan for the park. June 2012 The park was awarded Queen Elizabeth II Fields-in-Trust status. May 2012 New outside gym installed in north of park and new benches installed. Haringey Council has earmarked £260,000 (including Palybuilder money) this year for the design & creation of a new play area and for the design of a masterplan for the park. It intends to create a new play area in the southern end of the park. It looks like being an excellent play facility. It will have a toddler play area and an older children’s play area with conventional play equipment. It will also have natural play facilities around the mound and around the area.. It will use the mounds as a play facility for older children on bikes etc. FDLP have long emphasized the superior suitability of this area for play. 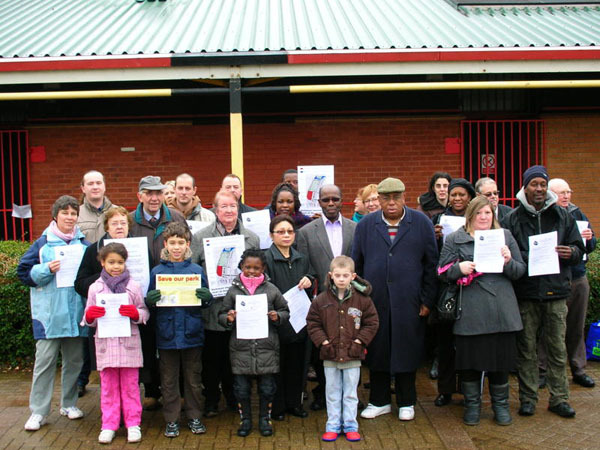 We campaigned successfully against plans to sell it or to move the play area to another part of the park. Haringey Council now agrees to our description of the park and the needs of the local population. It says “Down Lane is located in an area of high deprivation and intense urbanisation with significant housing development planned for the future. Tottenham Hale ward has been identified as having the highest level of play need of any ward in the Borough”. Our campaign for S106 money from the GLS development for the park is also successful. Haringey has restated that it has earmarked significant S106 money(£1.5 million) for the improvement of the whole park . It has not yet materialised and so we need to maintain our campaign and keep demanding that officers obtain the money from the developer..
will work with us to obtain money from the lottery and other funding sources to fulfil the masterplan for the park. To secure £300,000+ from the GLS development to add to the Palybuilder £170,00 for the new play area. To insist that Haringey fulfill its own guidelines on Community Consultation on the Ashley Road Development and any other development in this area. The S106 funding of park is not yet secured: £300,000+ of S106 was targetted in June 2009 for a new traditional modern play area to which the Playbuilder play area would be attached.
" I am negotiating with Lee Valley Estates on the s106 payments and one of my aims is to secure enough money paid early that could be allocated to the Park to fund the first phase of improvements, eg. a new play area. The Officer in charge of creating the new play area has given me a rough estimate of up to about £400,000 for a new play area - though part of that (£85,000 largely for the design work) can be funded from the allocated Growth Fund money." We are campaigning for this money to be made available at the Cabinet in June this year so that both play areas which are already being designed together are built at the same time. Haringey Council can either collect the money from the developer or supply it in lieu of collection. We are also campaigning for the rest of the unallocated £1.5 million of the S106 Social & Environmental pot to fulfill our vision for improving the park. Again the Chief Officer on the Ashley Road development has confirmed that planning officers have been earmarking this for the park. He also said that Haringey Cabinet could allocate it if it so wished so this too could be agreed at the June Cabinet meeting. This could be used to enhance sports facilities ,provide/improve other sports facilities especially in the southern end of the park ( our vision above). The park is the only social project within the Masterplan area where s106 money must be spent..
We will press strongly for Haringey to keep to its own guidelines on community involvement in all future developments in our area including the Ashley Road Project. Haringey's consultation conduct relating to local developments and the park has been attrocious at times..Hence we are submitting a formal objection to what has happened so far. Hurray again - Our 617 petitions have saved the park. Haringey Council sent out consultative leaflets to 7000 homes offering two options 1) build on southern end of park 2) build on the recycling centre area when that is moved. At the same time FDLP collected 617 signatures to a petition that proposed that no part of the park be taken away ever. Most of these petitions called for the park to be improved.These petitions have been lodged with Haringey Council. Only 225 people voted on Haringeys consultation leaflet and only 87 of those voted for the option of building on the southern section of the park -the land swap option. Cllr Alan Stanton and Cllr Sheik Thompson, members of FDLP , campaigned very effectively within the council. In addition Cllr Sheik Thompson lodged a motion to the full Council making the case for saving & funding the park. It had a very strong impact on the Council. "Taking the consultation results into account, the Council’s Cabinet in June 2010 will be recommended to agree that new development should be focused on existing developed land, retaining all of the existing Down Lane Park. The first phase of improvements to Down Lane Park will be designed and implemented in 2010/11 in consultation with the Friends of Down Lane Park using allocated funding of £255,000. Further improvements will be dependent on securing additional funding, including from developments (via section 106) in the Tottenham Hale area." Hurray - Our campaign for funding of new children play areas is beginning to pay off. Haringey has allocated £170,000 money from the Playbuilder scheme to Down Lane Park. Very publicly campaigned for improved resources for the park & aganst building on the park . Held Summer festival in the park. A bombshell has stopped us in our tracks. Haringey Cabinet has agreed (21st July 2009) a proposal to build new housing development around and on Down Lane Park. The southern section of the park will become a new housing estate. We are appalled and flabbergasted at this threatened loss of a substantial part of the park. This may delay even the design of the play area beyond the life of this Council administration and beyond deadlines for getting government money. This makes it all the more essential that Haringey Cabinet immediately rescinds its policy of building on Down Lane Park. See Save our Park . 2009 Our campaigning is beginning to pay off. Haringey Parks Development are optimistic that we will receive the funding of £400,000 for the new play area. This money can supply an excellent new playground for Down Lane Park. It will comprise a play area with modern equipment and additionally a natural play area. We are all proceeding on the basis that this funding will be available for next year. We are working with Jan Wilson, who will manage all of the park renovation, to design the new play area. Final design is scheduled to be completed by early February 2010 and work is projected to start on site in July 2010 and complete before March 2011. 2009 Haringey Council Cabinet has decided to allocate £145,000 to create designs and a business plan for a renovated park and a green link between Chesnut Road and Tottenham Hale station and beyond to the new houses. FDLP will be working with Haringey Recreation Services and Wynne Williams Associates in this venture. All who are keen in creating a new , better park are welcome to our meetings. Note: Wynne Williams replacing Groundwork. December 2008 We will be working with Groundwork – redesigning/renovating the park : Paul Ely, Haringey Parks Development Manager has commissioned Groundwork, an Urban Landscape Design charity, to work with local people and the Haringey Parks Development Team to renovate the park. FDLP will be heavily involved with this project. The project will begin next April and will consist of assessing the present situation and planning park renovations including redesign. Groundwork will also prepare a business plan which will make the case for funding. FDLP will be playing a critical role in redesigning and renovating the park. FDLP members are encouraged to get involved with Groundwork to obtain the kind of park we would wish. Some members will have special interest such as mothers of toddlers or people interested in sports development, others wanting more security and others concerned about elderly wishes. Many will want to take part in renovating the park overall. October 2008 We had a meeting with Tottenham Hale local councillors and also Recreations Services manager and lead councillor. We were pleased with the commitments made to get funding to renovate the play and sports area of the park. Below are the commitments they made. We wait now for the delivery of them and will keep everyone posted on any progress through these emails and through the website. Action points from FDLP meeting with councillors and officers on 27/10/08 at Welbourne Centre. Cllr Lorna Reith , local Councillor and Deputy Leader of The Council and Cabinet Member for Community Cohesion and Involvement. Promote in Haringey Council the funding of renovations to the park , especially the children’s play area and sports area. Bring the issue of the GLS Site S106 money to the Cabinet, where all Haringey major decisions are made, and propose there that funding be allocated to Down Lane Park. Note: £ 1million pounds for each of the next two years are due to be provided to the Council by the GLS site developer for local community projects. £5 million will be provided overall after all the building has been completed. This type of contractual contribution by a large developer to local community improvements is called S106 money. To introduce Friends group to a new group being set up & led by Greater London Authority(GLA) officers looking at options for developments in the area. Paul Ely, Recreational Services Parks Development Manager. That if Haringey is successful in obtaining a £2 million bid to Government for the children’s play areas, to explore the potential for locating the large adventure playground mentioned in the bid to Down Lane. Note: The Government has invited Boroughs like Haringey to bid for one of 30 pots of £2 million pounds to upgrade the borough’s playareas. A condition of winning is that £800,000 of the £2million be spent on an adventure playground in one playarea. To introduce our Friends group to Groundwork for us to work with them. Groundwork in is a voluntary group which works with local people to improve their local environment. To come back to our next meeting to further our cause together. Councillor Dhiren Basu: Cabinet Member for Leisure, Culture, and Lifelong Learning. To support Down Lane Park wherever possible and specifically to support the proposal for funding for Down Lane Park when Lorna raises it with the Cabinet. That if Haringey is successful in obtaining a £2 million bid to Government for the Borough’s children’s play areas, to propose that Down Lane Park be selected for the large £800,000 adventure playground. Councillor Sheik Thompson local Councillor who has been very active in Friends of Down Lane Park and is Chairman of local residents association CARA N17. To advance the proposal by all means possible in the Council. To press that this years GLS S106 site million pounds be allocated to renovations of the children’s play area and of the sports area of Down Lane Park. To press that if £2million playareas bid is successful that the Adventure Playground be prioritised for Down Lane Park. To continue as before to campaign passionately for local resources and facilities. Councillor Alan Stanton local Councillor and longstanding supporter of Down Lane Park and of Dowsett Estate residents association. To advance the proposal by all means at his disposal in the Council. To press that this years GLS site s106 million pounds be allocated to renovations of the children’s play area and of the sports area of Down Lane Park. To press that if £2million Borough playareas bid is successful that the Adventure Playground be prioritised for Down Lane Park. FDLP co-signed with Dowsett Estate Residents Association & CARA N17 a letter to Niall Bolger, Director of Urban Environment bemoaning the lack of security alongside the park on the way back from the Tube and requests that new lighting be installed there. The letter asks Niall Bolger what plans he has for renovations to the park and what is the timetable for implementing them. It also regrets the state of the pavements and asks that new pavements be installed. August 2008 Held a summer community event in the park jointly with CARA. Good fun and much support for what we are doing. Decided that an immediate focus of our campaign was to be for the Council to renovate/repair the toddler swings and ground beneath because they are so poor. This cannot wait for the full renovation of the children’s area. Started preparing for a summer community event in the park jointly with CARA. Decided to use website as forum for local people to express their views and publish photos with comments. Create publicity about ourselves and encourage people to join us and/or support our lobby for a better park. To do this using the community event, website, distributing publicity material and using the local media. 2008 We have received a ‘Making a Difference’ grant of ￡750 and CARA(Chesnut Area Residents Association) ￡1250 from Haringey Council to run a community event in the Park. 2008 Lobbied Council . Got more information. Connected with Haringey Friends of Park Forum. Applied for Making a Difference grant for a community event in the Park. Spent Autumn months interviewing local people in the locality and in the parks. Drew up a report and presented it to Haringey Parks managers. Haringey parks managers welcomed the report and its findings. They had already submitted plans for renovation of the park to be funded for ￡850,000 but so far those who decide funding have not come up with the money. A grant was due to come on stream in October 2007 but never materialised. Lobbied throughout the winter for the renovation of the Park (see Plea to Council) to no avail as yet. Restarted Friends of Down Lane Park(FDLP) group with some members from the original friends group and some new. Present: Seamus Carey, Sheik Thompson, Paula Symonds, Renalt Noel. Jo Moore , Oslyn Philips, Anna & Emma Young.